Let it be known that I added pictures to this post, and a few more comments, and a few more jokes: go ahead and reread it. The jokes really are that good. Really. And if you'll believe that the jokes are that good, I have some riverfront property in Seoul to sell you! Here's me (Superman) Robin (friend from Agassiz, in pink [come to think of it, I should have worn my Batman shirt. Har har har.]) 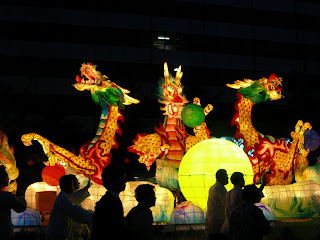 and Matt (my best friend/brother), at the Buddha's Birthday Lantern Festival Parade. I think I glowed in the dark last Sunday night when I went to bed, I was so happy. 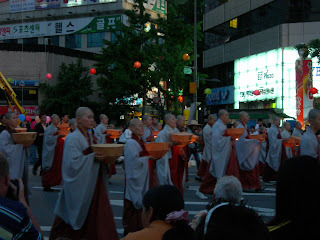 Thursday the 24th was Buddha's birthday, a major holiday here in Korea (not as big as Christmas in North America, but definitely a bigger party than Easter). 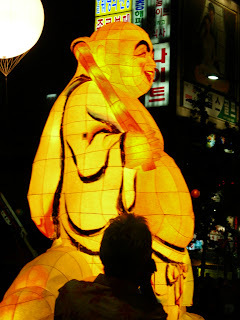 According to legend, when baby Buddha was born, he took seven steps, including one in each direction (north, south, etc. ), and then pointed with one hand at the sky and one at the earth. There were numerous images of the baby Buddha standing in the center of an opening lotus flower (don't know what happened to his mother, but there you have it), standing and pointing up with his right hand and down with his left. 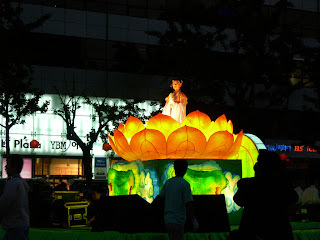 But anyway, whether he sprang forth from a flower like Venus from a shell, or came from a mommy and a daddy like most other human beings, the fact remains that Buddhism, Protestant Christianity and Confucianism vie with eachother for status of most dominant cultural influence on the Korean mind (with Confucianism winning in a rout, in my opinion). Well, Sunday morning, I met my friend for a truckstop breakfast in Itaewon, at a bar called "The Rocky Mountain Tavern", where you can not only watch hockey games on tape delay, you can eat eggs and bacon, and hash-browns and toast, just like at Denny's, except, instead of going "Wow, this greasy-spoon coffee is awful," you go "Wow. This awful coffee is just like home!" 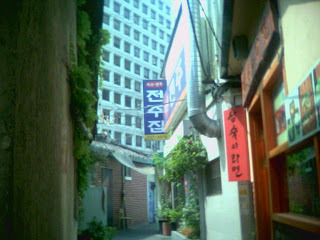 (That's when I knew it was time to go back to Korea -- when even Tim Horton's coffee stopped being a joy, and started being commonplace to me.) Then, after a short interlude at home, I met my friend Robin from Agassiz, who now lives in a suburb south of Seoul (still accessible by subway -- YAY Korea!) 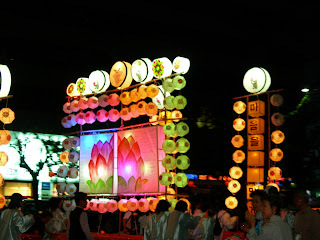 and we went for a stomp around my neighbourhood to see the lantern festival. We met up with two other friends, named Narae and Yunmi, two funny, smart ladies I meet at my school, and we wandered through downtown Seoul. 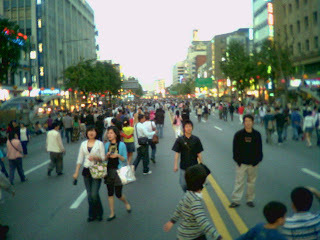 Entire roads near the Jogyesa Temple (one of the most important temples in Seoul) had been closed for the festival, with stage shows, music performances, martial arts demonstartions, and some really good break-dancing, and also some really cute junior (kid-sized) break-dancing. There were booths demonstrating Buddhist and Korean culture, including food samples, painting and drawing, costume and outfits, and so forth. As the day wore on, we chatted and wandered around different neighbourhoods, ending up back at my favourite restaurant in all of Seoul (and it takes some doing to earn that status with me), to eat some sparkling (meaning delicious, not shiny) Indian food, then stepping out of the restaurant just in time to see the first parts of the parade pass at the next intersection up. 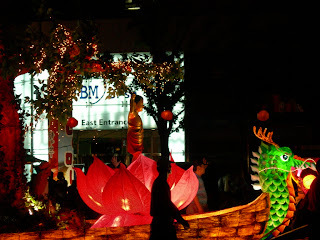 The parade was just like a western parade, except totally different. 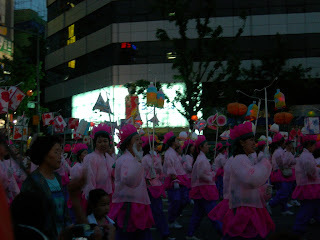 Take all the kilts and uniforms and change them into traditional korean robes and dresses, and switch the high school floats with people demonstrating Korean swordplay or old ladies carrying lotus flowers, and replace bagpipes with traditional Korean gongs, cymbals, drums and shrill double-reed instruments. And no shriners. Or church groups, seeing as it was Buddha's birthday. I guess the Christians stayed home that day. . . or maybe changed their stripe for an afternoon. Well, with my friend Robin beside me, and amazing Indian food in my belly, and a day of walking around at my back, I found my best friend/brother Matt watching the parade near my house, and sat with him-- I don't know how the day could have gotten much better, short of random poeple walking up to me and saying "You seem like a nice guy. Here. Have some cash." I told Robin that if I were any happier, there'd be two of me; the whole downtown was full of celebration and people dressed in their finest Korean clothes. The park near my house was all strung up with a latticework of lamps hanging from every high point to every other high point, all glowing with candles or electric light. The whole park, surrounded by walls to block light, was dark except these orange and green orbs hanging all around. From crashing cymbals and music outside, to this great quietness inside the park, and the peaceful spell of paper lanterns was a stunning contrast. The pictures didn't turn out, so to help you imagine how beautiful the park was, look at the picture below, and use your imagination to replace all the Audrey Hepburn with glowing, hanging paper lanterns. By the time Robin spotted the cotton candy she'd been seeking all afternoon, I was randomly grinning to split my face, and jumping up and down unprompted. 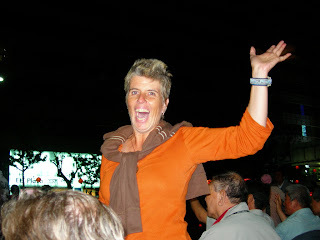 It was all I could do to keep from dancing around like the crazy Dutch tourguide who accompanied Heyjin's tour group. It's been a good time. 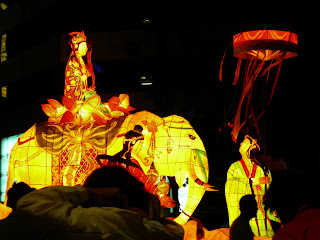 Buddha's birthday itself was the 24th, but it rained that day, so I met Sally, the genius, and we went to see a circus. After the circus (which was, as before, amazing: see previous posts) I met the lady who gave me my dental work a month ago. You may hear more about her later, but we had a very nice time eating at the nicest sandwich restaurant I know in Seoul, and generally hanging out together, walking around in the rain, sharing an umbrella. In July I'll return to Canada to see my Dad's wedding. That'll be nice. I miss my connections in Canada, but I'll tell you, Korea's sure amazing these days, too. It's been really good to me. 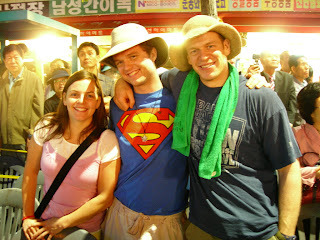 Recently, a few of my Korean friends have criticized me for having too many words and not enough pictures on my blog. Sorry. 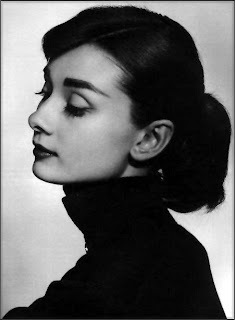 Words are my medium and my passion, and my camera's nothing but a junky little cellphone digital. I just got a webcam, but I can't exactly carry that around town and take cool pictures with it. The cord isn't very long. Yes, that's what I just said. I got a webcam! Now, you can meet me online, if you like! I can broadcast myself over MSN or whatever. . . but it's a little strange: partly, it's just like looking in a mirror, so I want to do the same things I usually do in a mirror: make funny faces, and see how it looks. But then, there's someone on the other end of the webcam watching, going "weirdo" plus, now I have to put on a shirt when I sit down to chat online. Sigh. It was pretty dark, that's why the colours and contrast in this picture are a bit wacky. Many floats from the parade. 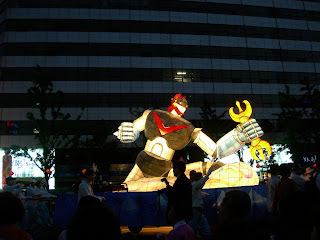 Of course, no Korean cultural experience is complete without a nod to asskicking robot warriors. I'm not sure how old the tradition of asskicking robot warriors is in Korea's culture, but it plays an important role in the entertainment industry now: at least as important as plastic surgery! These were impressive. 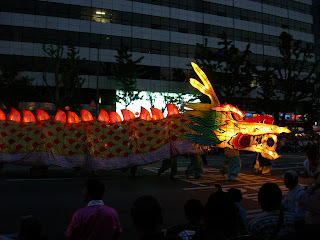 One of the dragons on a different float actually breathed fire! 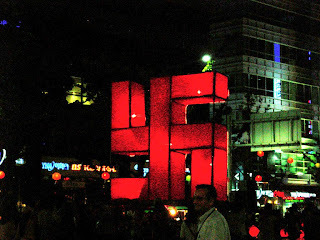 Below is what you see in a Korean parade instead of men and women wearing kilts or little shriners hats. And this is what you see instead of "Community Local High School Class of 2007" and waving cheerleaders and jocks. Heyjin's Dutch tour group all wore orange. 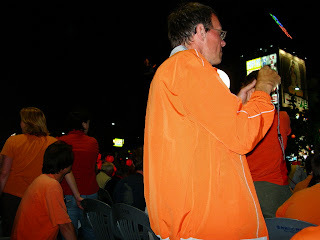 When Dutch people wear orange, it's like Canadians wearing a maple leaf pin: if you know anything about the country, you'll know what it means. The colour orange is a nice marker: easy to spot, but not as overbearing as a stars and stripes cowboy hat. Helped keep the group together, too. To imagine the street below in its normal state, replace EVERY SINGLE PERSON you can see with an automobile, and you'll know what rush hour looks like next to my school. The contrast here: come around an alley corner narrow enough that two people would have to turn sideways to squeeze through at the same time, and look up at an eighteen storey building. I love Korea. Here's the Tourguide Coby once again, for good measure. By the end of the night she was pulling old Korean gentlemen out of their chairs and forcing them to do some dancing turns with her. It was FAAAANTASTIC. Everything I love about Korea in a single day, seriously. Days like this just keep piling up -- if I enjoy my life any more I might pop. Hope you're all feeling the same way! Oh yeah. This one again too. I like the pictures you've added. I'm glad you had such a happy day. Say Hi to Robin for me next time you see her! (or, if you're reading this, Robin, "Hi!" My Neighbour Totoro: Movie time.